This edition from The Folger Shakespeare Library combines the best possible version of "The Taming of the Shrew" with wonderful illustrations and ancillary material. 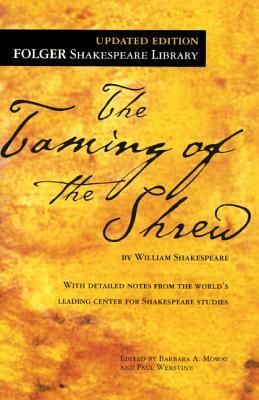 Renowned as Shakespeare's most boisterous comedy, "The Taming of the Shrew" is the tale of two young men--the hopeful Lucentio and the worldly Petruchio--and the two sisters they meet in Padua. Lucentio falls in love with Bianca, the apparently ideal younger daughter of the wealthy Baptista Minola. But before they can marry, Bianca's formidable elder sister, Katherina, must be wed. Petruchio, interested only in the huge dowry, arranges to marry Katherina--against her will--and enters into a battle of the sexes that has endured as one of Shakespeare's most enjoyable works. The Folger Library is the nation's best, most navigable and most respected resource for Shakespeare scholarship and teaching. The side-by-side format is favored by both students and teachers making it a truly unique edition, which has received high critical praise. Included in this edition are guides to the play's most famous lines, and Shakespearean phrases and language.